You may be wondering why some supposedly ‘healthy’ and ‘environmentally conscious’ companies deceive unknowing consumers into purchasing products with hidden additives and fillers. Perhaps one of the main reasons is that a large number of these pseudo-organic brands are owned by their very unhealthy ‘competitors’, such as Coca-Cola and General Mills. 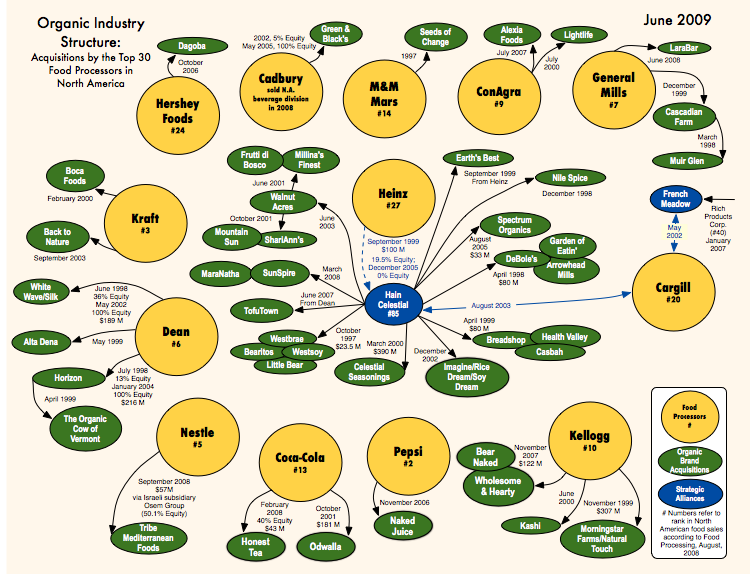 In fact, some of your favorite “All Natural” and organic companies may be owned by a corporate giant. Companies like Honest Tea and Odwalla may appeal to health conscious shoppers, but they are actually owned by Coca-Cola — the very same company that is currently fuming over the requirement to change their recipes in order to avoid a cancer warning label. Another popular ‘health’ brand is Kashi, owned by the Kellogg corporation. It should come as no surprise that Kashi cereals have been found to contain a copious amount of GMOs and pesticides, according to an explosive report from the Cornucopia Institute. Kashi’s ‘Heart to Heart Blueberry cereal’ was found to contain grains coated in the residue of many pesticides such as phosmet, carbaryl, azinphos methyl, malathion, chlorpyrifos methyl, chlorpyrifos. What’s more, the company’s products were found to oftentimes contain 100% genetically modified ingredients. When viewing this information, it becomes much clearer as to why many ‘health food’ companies are deceiving you about the ingredients in their products. It’s time to move away from companies that have been bought up by corporations like Kraft and Coca-Cola and support independent organic brands that actually abstain from GMOs, pesticides, and hazardous additives. The fact of the matter is that these corporate giants know that people do not want to buy their health-crushing garbage anymore, and are making a last ditch effort to buy up phony health companies in order to secure their fortune. That is why we see legitimate brands like New Chapter being grabbed by Proctor & Gamble. While pretending to be a part of the health movement, these corrupt ‘health’ brands are doing nothing but deceiving customers and wrecking the health of families worldwide. What they don’t expect is activism to completely financially suffocate their attempt at playing the good guys. This post contains an excerpt from the ‘Finding Out If Your Food Contains GMOs’ section in my new health book. I WAS READING A LABEL AT TRADER JOE'S, I THINK IT WAS ORGANIC PUMPKIN….LISTED, WAS ORGANIC NATURAL FLAVORS…WTF! I live in FL and cant get raw milk for human consumption. Farmers have resorted to selling "pet milk" and you must not dare mention that you plan on drinking it or out of fear they will not sell it to you. So scary that "the gov" has a hand in all that we eat and drink. Why would I ever trust this country to feed my family??? Can "organic" labeled foods contain gmo ingredients? Yes. GM seeds can be "grown organically" which means then they can label them as organic. Also, 'organic' only has to be 95% organic to get that label. Check the 'califorina right to know' campaign webpage for GMO free shopping lists. I believe they have it on there. By Federal Regulation anything labeled as “100% Organic USDA” CAN NOT knowingly contain any GMO ingredients. (well, if you don’t have any trust at all in Federal Regs, I can’t help you.. but there it is). There are varying levels of Organic labeling, which also have their own Federal restrictions. If you have knowledge of any company knowingly and falsely using any Federally Regulated Organic labeling, report them. Well I would like to propose we, and anyone who knows to start a referral page on Natural News of companies that are truly their own and true to the definition of an organic product. while we are at it why don't we also have a listing for where the last of the mohicans of organic /NON-GMO/ heirloom seed resources are…..
For those interested in knowing the history of how all of this came about (and I'm talking damn near the bottom of the rabbit hole here), read Anton Chaitkin's "Treason in America". It's a bit tough reading but well worth the time. This is American history as it happened and NOT American history as "they" chose to teach us. BTW, see who "they" are that created the American Historical Association in 1884 (see the Island Earth timeline at "http://truthbetold.webuda.com&quot;). Hmmm… Why do you suppose two members (one of them a founder) of an infamous "death" cult, would be interested in also founding the premiere organization that concerns itself with American history? That's just ONE tiny example of what you can discover in the aforementioned, non AHA-certified timeline (and it ain't done yet). Ain't history fun? Make your bread, muffins, bisquits, pancakes, waffles, pastries, cookies, pies, cakes, candies from scratch the old fashion way. That way you won't miss out (except on the death killing poisons, of course). Remember that is what our pioneers did. They didn't have a TV dinner to turn to. If they did it so can we. And I know for a fact that the food is by far and above tastier then any processed stuff on the shelves. BTW, try to get cookbooks dating before the 50s on the net. They offer simple but time honored recipes for the basics. Good Luck! I think Bobs red mill is still safe, please correct me if wrong.I would like to know. the only way to make sure these enemies of America die slowly, is to eat raw. Buy only minimum of processed food. If you have children, teach them by example. this is the only way to ensure the future generations will be smart enough to burry the bastards, by buying only raw, minimum processed food. 90% of all "bread" = poisons. The labels say everything. A loaf of simplest bread should contain max. 4-6 ingredients, right ? it's not the case with 90% of breads. they only look like bread. Avocado, broccoli, cucumbers, things like that, are excellent foods. This way we'll avoid buying from nazi "food" corporations. Organic produce? Perhaps. But even that is likely grown from GMO seeds because Monsanto has made it damn near impossible for large scale organic seed purchase. You notice how they are starting those anti-smoking ads? WHen the Commie take control they won't want you drunk, on drugs or messed up physically. I see these anti- smoking ads and wonder why they don't just quit making the stuff and they should close the bars and get drunks off the road. The reason they are running all of the anti-smoking ads is so that they get a tax deduction for preventative-community program donations. They never do anything that doesn't benefit themselves, and even if they are legally forced to do something-they find the loophole. As a matter of fact many of these sites where you can donate-and I am talking the full range here, from Jerry Seinfeld's wife's foundation to Angelina Jolie's all the way to Feed the Children- you can look at the financials for these companies and MANY of them have high percentages going to "administrative costs" and their CEOs… its like anything else, start something that you know you can get a peice of, and feed both sides of the war- that way you never lose. These corps are really smart.. The corporations do this everytime. No doubt the tobacco companies own the stuff to get you to quit smoking. The government you trusted and they poisoned your children with depleted uranium and poisoned you with fluoride and all the crap they put in the food. You eat something and can't even read the ingredients and shame on you. You can't afford not to grow your own food now. You can't afford to live an hour from work and afford the gas. Bad times are coming, but people are buying containers to put in the ground. I would just wait in the bushes you will come out sometime. You exit and you are shot and your food is gone. I will begin boycotting all Rothchild controlled American made products! Screw the globalists who worship at the altar of the evil one with their ritualistic wars of death and destruction! In 1961 Kennedy Administration officials McGeorge Bundy, Robert McNamara and Dean Rusk, all CFR and Bilderberger members, led a study group which looked into “the problem of peace”. The group met at Iron Mountain, a huge underground corporate nuclear shelter near Hudson, New York, where CFR think tank The Hudson Institute is located. The bunker contains redundant offices in case of nuclear attack for Exxon Mobil, Royal Dutch/Shell and JP Morgan Chase. You think they won't do something if half the people grow their own food? ALmost everyone grows a garden in Europe. We forgot how. Food eas so cheap. But now when a can of beans is a dollar and look at sweet corn which by the way is almost all GMO. They will poison you one way or another. Grow just a couple veggies. Corn, cucumbers and tomatoes will feed you and easy to can. Go to http://www.windowfarms.org build one or buy one. join us. jc, don't despair, do you really think that GOd would make it hard to grow veggies and fruits- if that is what he wanted us to solely live upon. listen, plants grow with soil,sunlight and water. That is really all you need. Go to the countryside, in an unadulterated area, or even in the woods, where no on has inhabited- and just dig up some soil. That will mostlikely be free of pesticides etc. And bring it home, disperse into 5 gallon buckets, (drill holes in the bottem first so roots don't get root rot) and some kind of large plate or bowl on the bottom to catch the water unless you have a porch. Then get heirloom, NON-GMO seeds, one good place is seedsavers but there are many. Last year on a travel assignment away from my home, I grew tomatos, squash, summer squash, cucumbers, lettuce and spinach on my porch. YOU CAN DO IT!! whoops tomatoes too! lots of them- and especially for men they are great. Like affordable ELECTRIC CARS are bought up by ICE (Internal Combustion Engine) conglomerates BP (Big Petroleum) and its Big 3 Grease-gun MOLL$! How are Americans to know which organic/healthy companies are legit? I've uses The Cornucopia Institute reports, but what other resources are around? it doesn't matter if you grow it yourself, the seed of all this is already manipulated… have fun growing pesticides! I do whatever I can not to support small business. We must teach our youth to support each other and to stay out of corporate work enviroments and especially out of any military jobs or companies that support the military. They play their games and we play ours…and they can not have my kids! yes, I buy stuff in Dollar General and smaller grocery stores. Sav-A-Lot is cheaper they won't have the selection but who needs six brands of beans or corn to pick from? You will pick the cheaper one anyway. Those huge stores takes a lot of money to transport that stuff and to stock the shelves. Jason, learn about genetically modified foods. Dollar General and Sav-A-Lot foods will kill you. Even if you grow everything you eat, the danger of cross pollination from GMO crops cannot be avoided. Then there’s the question of what is falling out of those trails in the sky. Don't forget Clorox owns Burts Bees. Tom's of Maine has sold out as has Jason Natural products. Go with Graham Gardens. Owned and run by one family, they refuse to put anything not pure and natural in any of their products. They will never sell out. If the USA can bully the world into boycotting Iran over having the audacity to want electricity, the world can stuff the USA by boycotting the USA. I'm not going to purchase another USA product. They can't be trusted to tell the truth about their products they have to be treated like the poison they probably are. So sad but so true! I boycott all American (US) products. Just as long as you also boycott Made in China products! I can live without eating any processed food, but it's tough with kids, especially when sending all their food to school. I can't even find a granola bar that is low sugar and organic grain! I know it's tough, but you can make your own. The food industry will not make it easy for you. Even those who grow their own have to look out to make sure the seeds are non-GMO. There are companies that grow and sell heirloom seeds. Yes! make sure it say 'certified organic' or heirloom. I struggle the same dilemma Violet. It is hard to cook everything. It is crazy to think that there really are no alternative that are not controlled somehow. Try to get involved in starting a school vegetable garden where kids can learn to grow, harvest, cook and eat healthily. We have one at our local school in conjunction with a community garden and the kids ranging in age from 5 to 13 are extremely enthusiastic in sowing, planting and harvesting,possibly even more so than the adults. I volunteer to teach them once a week and am loving every minute that I'm there. I am also going to run food growing workshops for the adults. I am so tired of all this crap. More and more, we are finding ways to avoid buying packaged foods and grow our own. Who knows how much longer growing your own food will last before Monsanto convinces the retards on Capitol Hill to make it a crime! If you read what is happening to farmers… idividuals are not even allow to grow food for their families! NonGMO seed are really disappearing. Very frightening. Stock up. That's sure to become criminal, too, but you could well be saving an entire neighborhood soon. All us oldies new this was going to happen, soon as the organic industry started making lots of money, it was only natural for the greedy corporation to jump in, but know worries, just support your local farmers, farmers markets or grow your own, easy pecy. Wonder why no one trusts Corporate America. Could it possibly be due to the constant LYING?